This page lists the details/specifications offered on the Adamson Design Emailer Offers sent out April onwards 2019. The Emailers are tight for space, so the CLICK HERE buttons take you to this page for a full description of what packages are offered. Brand Identity for your new brand – Packages from £600 + VAT. STAGE 1 Visuals – I will offer 3 different Brand Identity concepts/“routes” at the first stage for you to select from. There will often be colour and typographic options within each of the 3 routes. STAGE 2 Visual – I will then develop your selected route, finalise it and present it to you for approval. Other formats if appropriate eg reversed-out white, shaped to fit a different outline. POSSIBLE EXTRAS: If photolibrary images are required, they are usually £30 each on top of the £600 fee. Extra visuals or revisions required by the client will be charged at £50/hour. APPLYING THE BRAND: Showing the Brand on stationery, brochures, vehicles etc is another job and would be quoted separately if it is required. All prices are shown ex-VAT. Adamson Design is VAT-registered and VAT will be charged. Not included in Package: Naming your identity/business, copywriting, custom illustration, custom photography. Get a new Fabric Wall Exhibition Stand – Packages from £799 + VAT. STAGE 1 Exhibition Stand Visual – I will offer an Exhibition Stand Visual of the front of the stand (fabric stands are double-sided). STAGE 2 Visual – I will take in your comments, adjust and finalise the design and present it to you for approval. STAGE 3 Artwork – Having got your approval at Stage 2, I will create full-colour high-resolution or vector Artwork for the front of the stand. The exact same imagery can be repeated on the back of the stand at no extra cost. Again, a PDF will be sent to you for final approval. STAGE 4 Production – The Straight Wall Fabric Stand, size 2.3 metres high x 3 metres wide, will be printed same design both sides OR with a blank back. The Fabric Stand plus its aluminium frame will be delivered to you disassembled for you to test-assemble and check. Assembly instructions and a carry-bag are included. POSSIBLE EXTRAS: If photolibrary images are required, they are usually £30 each on top of the £799 fee. Extra visuals or revisions required by the client will be charged at £50/hour. Not included in Package: Copywriting, custom illustration, custom photography. 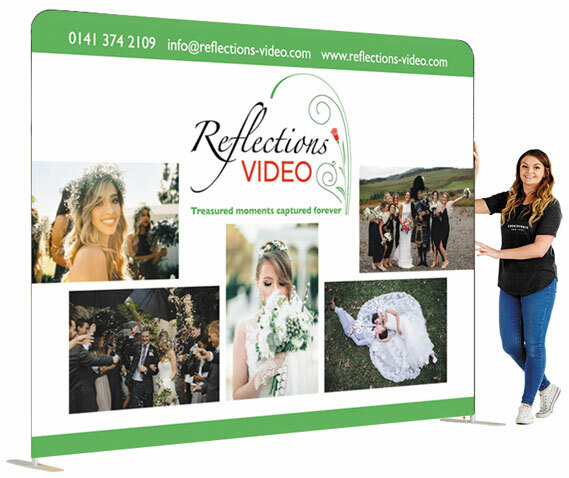 This is the same as the £799 Package, except that the two sides of the Straight Wall Fabric Stand will be designed and printed with different images. Plan for two different uses or target groups and use whichever side is appropriate. Only £200 extra for creating different designs each side. POSSIBLE EXTRAS: If photolibrary images are required, they are usually £30 each on top of the £999 fee. Extra visuals or revisions required by the client will be charged at £50/hour.